Oleskiw River Valley Park is an important link in Edmonton's river valley park network. To help ensure Oleskiw River Valley Park remains a vital public space, the City is undertaking a master plan process to establish a 25-year vision and management plan for the park. The resulting plan is projected to be completed in the first quarter of 2019. Oleskiw Park is a 193-acre park located in the west end, south of the Fort Edmonton Footbridge and adjacent to the Edmonton Country Club. In its current form, the park includes a formal trail and several informal trails, as well as various natural vegetation areas. There is currently no vehicle entry into the park, which may limit its development. The Terwillegar Park Footbridge and West End Trails projects will formalize a shared-use path through Oleskiw River Valley Park. This trail will increase park usage, resulting in the need for a master plan to determine a vision and identity for the park and what infrastructure is needed to accommodate park users. The public consultation will help to craft a vision for Oleskiw River Valley Park and establish the guiding principles that will form the basis for building a plan for the park. The master plan will plan for a lasting legacy for Oleskiw River Valley Park that is unique to the surrounding neighbourhoods, and considers the park’s natural and cultural identity. 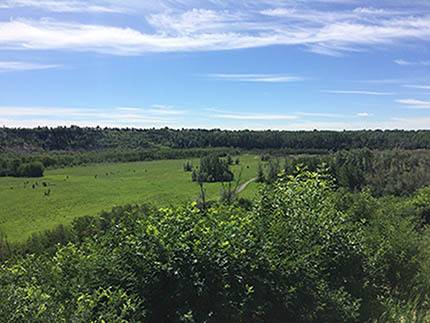 This work will reflect the needs of today while enhancing and preserving the ecological integrity of the park as part of Edmonton’s river valley park system for generations to come. Community and Public Service Committee. 2018: Environmental Impact Assessment and Site Location Study. In the summer of 2016, the City undertook a detailed inventory and site analysis of the park. The City invited the public to join the conversation about the park. The City outlined the engagement plan for the development of the Oleskiw River Valley Park Master Plan. Opportunity for the public to provide feedback on the preferred concept. Refining the park vision, principles and identity, as well as getting feedback on the two distinct concepts for the park. The creation of vision, principles, and identity as well as a selection of programs and activities for the park. A detailed inventory, site analysis and a greater understanding of how the public uses the park. Activities included: A public engagement session, online mapping tool, intercept surveys and stakeholder meetings. New and upgraded trails will link the Terwillegar Park Footbridge to existing trails.